I may not have dressed up for Halloween, but it was scary how much I enjoyed my escape from the city. I was finally able breathe fresh air! Well, 152% humidity and straight heat make it a bit hard to breathe, but it still counts as fresh non-polluted city air in my book. On Saturday I caught an early bus to Quepos (the town a few miles from the Manuel Antonio National Park), which is only three hours out of San Jose and I got there in time to enjoy the beach before the storms rolled in for the night. Now let me tell you, the beaches of the Pacific Ocean are pure magic. You know those computer screensavers and wallpapers that have unrealistically perfect palm trees and white sand beaches under a beautifully sunny sky? That’s basically Manuel Antonio in a nutshell. This was my day: swim in the warm ocean water, dry off in the sun, get way too hot 3 minutes later, go back into the water, repeat. It’s honestly a foolproof formula. There are also a few short hikes that overlook the beaches and, despite sweating at least five gallons on one tiny trail alone, it was absolutely worth it. And you can just go swimming after to cool off, so win-win. The park is also home to an abundance of wildlife, which I 100% recommend a tour guide for because I would not have seen 95% of the animals without one. That leftover 5% is for the capuchin monkeys – those mischievous little devils come out of nowhere and even know how to unzip your bag to steal food, which is simultaneously annoying and extraordinarily impressive. Our guide spent 2 hours pointing out everything from 7-foot iguanas in the trees to howler monkeys hiding behind ginormous leaves. I don’t know what kind of training goes into being able to see 3-inch grasshoppers or camoflauged baby bats from 50-feet away, but it is seriously impressive. 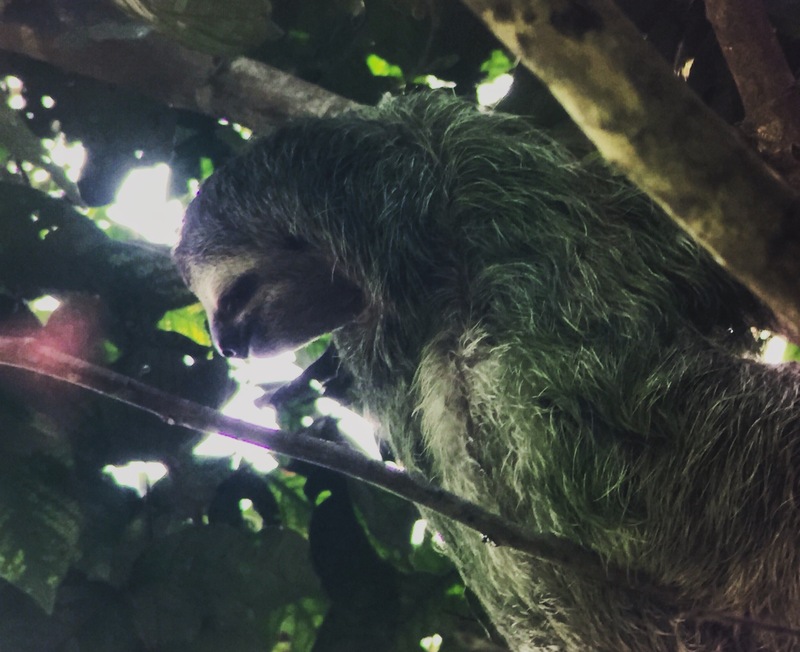 On the tour, I was easily the most giddy about the perezoso sightings; aka, the sloths. My love for these majestic creatures runs deep and I feel like my life is nearly complete now that I’ve seen one in the wild (my life will be completely complete when I am able to cuddle one and then I will declare that as the most magical moment of my life). Plus, the highly scientific and reputable research-based source, Buzzfeed, solidifies the indisputable fact that the sloth is my spirit animal (your turn, you know you want to click this). Now without being too prejudice of the beautiful sloth family, I have to say that I have a slight preference for two-toed sloths over three-toed (there is a much bigger difference than just the number of toes – google it), but sloths are sloths are sloths and I’m happy we spotted the three-toed one at all. Fact: Sloths only weigh around 10 pounds because their bones are hollow which makes it easy to climb trees but also makes them really slow. Fact: It takes them a month to digest food and they only climb down their tree once a week to relieve themselves. Fact: They are excellent swimmers. Fact: I could go on all day about sloths. Popular consensus has it that Manuel Antonio National Park is one of the top things to do while in Costa Rica and it’s easy to see why. I loved it, even if it was a little too busy and touristy for my taste (but that’s nearly unavoidable on any of the Pacific beaches). It was a short trip to Manuel Antonio National Park, but alas, duty calls and I regretfully had to tear myself away from the beach and head back to the city. ¡Hola from Costa Rica! I’m happy to keep you entertained at work and that it also loads fast (it doesn’t always seem that way to me down this way haha). Have you been to Central America before?